Yesterday’s progesterone was 3.35. Depending on who you listen to, ovulation happens at about 5ish and remember the eggs need a couple of day to get ready for the party — all that means we are not leaving today but will leave tomorrow instead. Another progesterone will be done later today. And so we can set all that aside and talk about other things. For example, much congratulations are in order for Team Tristan (iPup). Tristan finished his CD (an obedience title) yesterday, making him a VCD1 (an AKC distinction requiring titles in tracking, obedience, and agility). VERY COOL. Congratulations to Team Tristan. Specialty training is in high gear around here. Harper has a TD track at the Specialty — even though she has the title, she can still do the test because there was space for a titled dog. Therefore, Harper has been added to the tracking training rotation, much to her great delight. Claire is the first alternate in the Specialty TDX. Bummer but if one must be an alternate, that is a good spot to be. 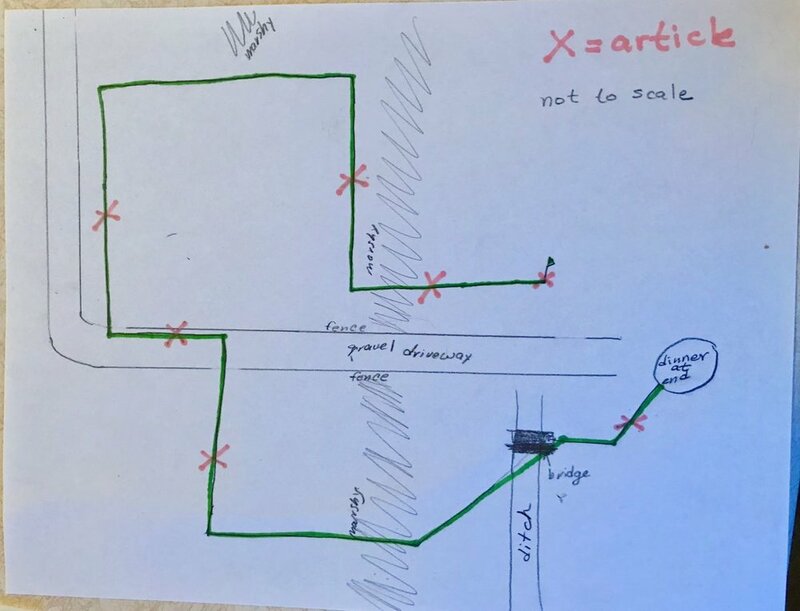 I usually do not draw maps but to illustrate some points from Claire’s training I thought a visual would be useful — this is yesterday’s track. A TDX track is aged at least three hours — in training, Claire’s tracks are always 3+ hours old. This one was laid at 2 pm and we ran it at 5:15 pm. Claire’s starts can require patience (i.e., she runs in circles before settling in) but yesterday she made a great start and quickly found Article #1, which was placed far enough to reward her for a solid start to the track; I trade articles for treats and so articles are highly reinforced and reinforcing. The track went through a marsh — on one side of the track was a dead hawk just begging to be rolled on and on the other side was a large puddle. Just guess which drew Claire off her track? If you guessed water, you are correct. After stretching out in the muddy puddle for a minute, Claire got back to work. She easily made the first turn and the second one, and found the next article. The fourth turn was tricky — she had to turn immediately after an opening in the fence and go along the driveway; she successfully navigated this and found the strategically placed next article. Then she had to cross the driveway - TDX tracks have obstacles and the driveway is considered an obstacle. She did the turn, crossed the driveway and headed into the next field where another article rewarded that effort. Another turn and a hop over a downed tree, which represented another obstacle, and she was back into another section of marsh. Again, she had to take a quick dip in the water before heading out and up to make another turn, cross a wooden bridge, and find a leather glove placed to reward that section of the track. Do your dogs think of articles as rewards? My dogs sure do. From there it was about 15 yards to the end of the track, which was dinner in a sealed bowl. All of our tracks end with a meal — every single time. I am not sure why anyone with a food motivated dog would do anything different?? It was an exhilarating track. Seriously exhilarating. I am so grateful to my friend, Joni, who lets us use her fields to train. And I am grateful for talented dogs who love to track as much as I do. Yesterday we tracked at the friend’s place, which she calls Dragonfly. The snow was over a foot deep and let me tell you — that is quite the work-out! Things that go imperfectly — like missing articles — are not a Big Deal. Rather, they are just information for future training session. Nobody loses a birthday when there is a misstep in training — or competition.